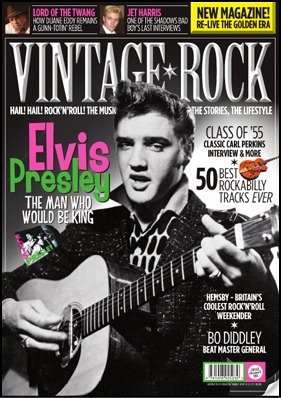 The FIRST issue of the new ' Vintage Rock' UK Magazine rightly features Elvis on the cover. 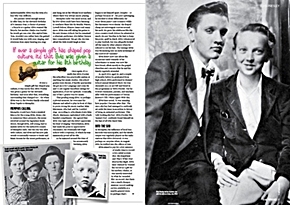 Inside the magazine, fans can read a great feature article that details Elvis' early years (up to 1955) and also check out some rare childhood photos. The first two lines of the Elvis feature article read, "Elvis Presley was more than a singer. He was - and still is - an icon of pop culture, the first larger than life superstar, a folk hero and legend, yet also something of a myth." In addition to the article, you will also see where Elvis ranks on their "Top 50 Rockabilly Records of All Time" listing. These records were chosen in an online poll on Vintage Rock's Facebook page. EIN checks out this new magazine..
Vintage Rock is a new magazine coming out of the UK. There are plenty of fascinating articles - one particularly interesting one on why UK rock'n'rollers were forced to use cheap european guitars and home-made amps rather than the classic US models! 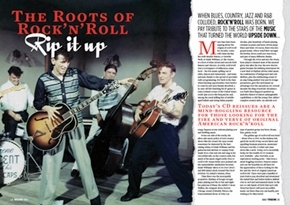 There's a classic Carl Perkins interview as well as their great selection of "Top 50 Rockabilly Records of All Time". The magazine also features plenty of ELVIS. Below is part of the main article by Michael Stephens on the early years of our man. Elvis Presley was more than a singer. He was - and still is - an icon of pop culture, the first larger-than-life superstar, a folk hero and legend, yet also something of a myth. In today's X-Factor culture, stardom is transient: despite huge success, no-one can seriously believe Susan Boyle will be anything but a quirky footnote in pop history in 20 years time. Thirty four years after Elvis Presley's death, his allure remains astonishing. Type 'Elvis' into Google and you get 88,000,000 returns. By contrast, the UK's biggest pop icon, 'Lennon', gets less than half that. Google is certainly not the arbiter of all, of course, but the search sends a message. Elvis is still all around. It's partly the myth that still fascinates, as the basics of Elvis Presley's life read like a fable - his rags-to-riches life story featured family tragedy, a meteoric rise to fame, unrivalled adulation, opulent lifestyle, excessive habits, and a tragic demise. But what a rise it was. And Elvis Aaron Presley’s remarkable influence on world pop culture began when he was just 10 years old. The Presleys lived in Tupelo, Mississippi, and it was here that Elvis made his first public performance. Even at this tender age, Elvis would spend many Saturday afternoons at the Tupelo Courthouse from where the radio station WELO broadcast its Saturday Jamboree programme. The Presley family were not musical, but young Elvis was entranced by song. He sang Old Shep, a song about a 19-year-old German Shepherd dog, for WELO a few times. But when, at the beginning of his school term in 1945, pupils were asked if they would like to read or sing a song at assembly, 10-year old Elvis obliged. He sang Old Shep again. His teacher Oletta Grimes remembered, ‘He sang it so sweetly.’ The school principal was similarly impressed and they decided Elvis should be entered into a singing competition in the upcoming 1945 Mississippi-Alabama Fair And Dairy Show, held in Tupelo. Legend has it that Elvis, wearing glasses, had to stand on a chair to reach the microphone in front of several hundred people at the fair (other attractions at the event included such items as mule-pulling contests). Elvis sang alone, and he didn't win: some early records say he was second (myth again). As Presley himself later said `I think I was fifth.' But he did win free passes for all of the rides at the fair, plus $5. Plus, he got to be broadcast on his beloved WELO Saturday Jamboree programme. Five bucks was a lot of money to young Elvis. The Presley family were poor and constantly fretting about money. Meagre meals of cornbread and water were not uncommon in the Presley household - a sad situation which, some might suggest, shaped Elvis's later addiction to lavish meals. But parents Gladys and Vernon Presley doted on Elvis as best they could, even if he wasn't immune to a whipping for bad behaviour. However, their ultimate love was so understandable: Elvis was the twin of a boy who was stillborn. If ever a simple gift has shaped pop culture, it was surely this: Elvis Presley was given a guitar for his eleventh birthday. And soon after that, everything surrounding him changed too - for when Elvis was 13, the Presley family relocated from Tupelo to Memphis. Memphis would have been a musical Mecca for the Young Elvis. Home city to numerous blues pioneers, the scene revolved around the legendary Beale Street, though Elvis, still young, had to mainly settle for the seductive sounds of Memphis radio. But the city was alive with culture, and Elvis and his new pals would occasionally venture to Beale and Main Streets for the street performers, or just hang out at the vibrant local markets where there was always music playing. Once again, it's a myth that Elvis Presley the schoolboy was practically useless at anything but music studies. His school grades were decent, if hardly spectacular. He got an A for Language and some Bs and Cs yet regular Excellent ratings for application, if not for aptitude. Ironically, one of his C grades was for music. That grading stung Elvis. In perhaps a pivotal moment, he overcame his shyness and asked to play in front of class to prove wrong his music teacher Miss Marmann, who had said he 'couldn't sing.' According to schoolmate Katie Mae Shook, Marmann capitulated with a backhanded compliment: 'she agreed that Elvis was right and she didn't appreciate his kind of singing.' Nevertheless, Elvis had made his point to appreciative classmates. He eventually left High School with a Diploma, of which he was immensely proud all his life. As he matured around the time of his seventeenth birthday, Elvis began to set himself apart. Despite - or perhaps because of - his poor upbringing, he decided to dress differently. He wore 'dress pants' (suit trousers) while his classmates wore denim. He draped cheap yet extravagant scarves around his neck. He grew his sideburns like the cross country truck drivers he admired so much. He put Vaseline in his hair to keep his proto-quiff in check. Elvis volunteered to play football, but was allegedly kicked off the team by other players when he refused to cut his hair. The teenage Elvis was blossoming into an early archetype of the rock'n'roll 'outsider'. Elvis didn't now care about the occasional snide remarks of his schoolmates as music was now his best friend, albeit mostly in the gospel churches and concerts that he and his family regularly attended. In April 1953, aged 18, and a couple of months before he graduated from high school, Elvis performed in Humes' School annual Minstrel Show. He was sixteenth on a 22-act bill and listed in the programme as 'Elvis Prestly', but he wowed classmates, parents, and teachers alike with his performance of Teresa Brewer's Till I Waltz Again With You. Elvis later noted, 'It was amazing how popular I became after that.' The once-shy boy had managed to suddenly set aside his inner insecurities in favour of being an animated performer. 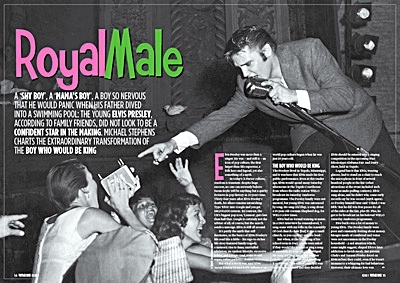 This ‘odd-looking shy boy', Elvis Presley the `mama's boy', suddenly found himself on the lips of all who knew him.
. Go here to buy VINTAGE ROCK on-line magazine for the rest of the article.. In another article ‘The Roots Of Rock‘n’Roll’ VINTAGE ROCK magazine pays tribute to the stars of music that turned the world upside down. Artists featured include Bill Haley, Buddy Holly, Bo Diddley, Carl Perkins and Gene Vincent. Elvis's delivery makes, these raw takes accelerate out of the speakers like a juiced-up '38 Ford with the pedal jammed to the metal. 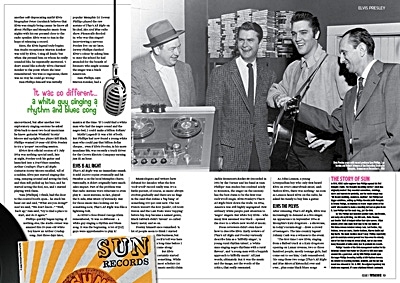 It was a hot day in 1954 when Sun Records producer Sam Phillips made rock'n'roll history in his small recording studio. The singer was Elvis Presley, the bassist Bill Black, the guitarist Scotty Moore - the last two being experienced pickers who held down a regular slot with a combo called the Starlight Wranglers at a Memphis nitespot called the Bon Air. As the fledgling outfit ran down a selection of covers, Scotty Moore reached into his Merle Travis, Chet Atkins bag of tricks, interjecting stabbing fills when he could. The second tune was ‘Blue Moon Of Kentucky’, the third or fourth was ‘That's All Right’. Even today, Elvis's delivery makes, these raw takes accelerate out of the speakers like a juiced-up '38 Ford with the pedal jammed to the metal. Elvis's band played a crucial part. Scotty Moore combined jazz, country and blues to define rockabilly guitar. For all his knowledge of Chet Atkins plus hip jazzers like Django Reinhardt, Tal Farlow and Johnny Smith, Moore was a wild player who could produce chaotic, colliding chords and runs. It's this crazy streak that makes Scotty such a lasting figure. ‘Too Much’ is the sound of a guitarist losing the plot. The amazing trio would not last. `Colonel' Tom Parker came on board and tried to get rid of Moore and Black. Soon the pair were making less from concerts than the souvenir-sellers. The band fell apart in '58 when Elvis joined the army, but when the musicians buried the hatchet to help him out on the'68 `Comeback' TV special, Elvis pocketed $50,000, DJ Fontana and Scotty Moore little over $200 each. But none of the bad history changes the simple fact that, without Bill and Scotty, Elvis's early work would never have had the same effect. EIN notes that the magazine articles do feature a few notable mistakes - they have Bill Black playing at the 68 Comeback Special - however the magazine is well-worth investigating and all the articles are another good look at early rock'n'roll.
. Go here to buy VINTAGE ROCK on-line magazine or check out your local newsagent now. 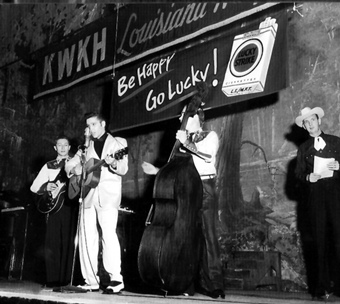 See EIN review of the book "Elvis The Louisiana Hayride Years 1954-56"